On our website you can see localized version of Pivot Table in Demos – Localization, for example to Spanish, Portuguese, Chinese, etc. The following article describes how Pivot Table can be localized. Set localization for Pivot Table. Localization JSON file is the JSON file that has the list of all text messages and labels that are used in Pivot Table and can be localized. If you plan to use one of localizations, that is used in our demos, you are free to download respective localization file from our site. Just click the file with language below or right click and save locally. If you have downloaded one of the above files, you can jump to Step 2. Set localization for Pivot Table. If you use different language, it is possible to create your own localization file. We recommend using English localization file as a template. Download it, make a copy and replace all English texts with your own. After creating a new localization file, our team suggests sharing it with the community to help other users. New localization files can be added by creating a new pull request on GitHub. Flexmonster team will highly appreciate any new localization files and add them to our website. In the following example, we localize Calculated Values window in Pivot to French. The original section of localization file looks as follows. Now we replace the respective terms with French. 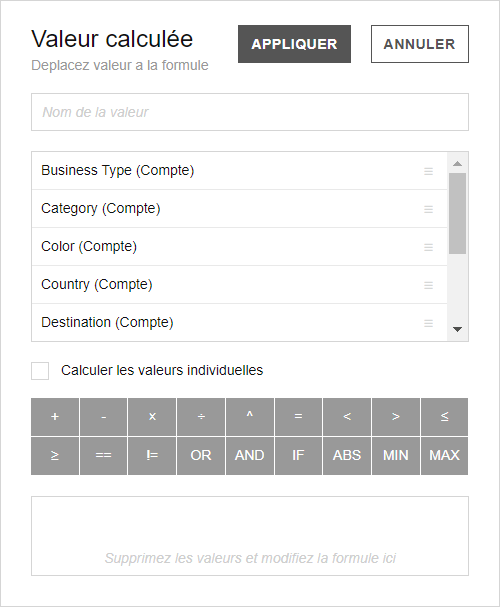 "calculateIndividualValues": "Calculer les valeurs individuelles"
Your localization can be partial. For example, if you don’t need to localize Pivot Table completely, you can replace only those JSON objects that are necessary to translate. If certain label translations are not mentioned in the Localization JSON file, they will be set to default English values. To specify different localization for particular report you should set localization property in the report object.